Wether you're a blogger or instagramer, you know how hard it is to keep track of your life, content, and schedule all at the same time. You are probably like I was and have a bunch of ideas written down in 3 different notebooks, or have a dry erase board for your schedule. Not that any of these ideas are bad, but there's something better. *This is a sponsored post. However all the statements said in this post are my own opinions. I would never recommend a product I didn't like. who was this designed for ? 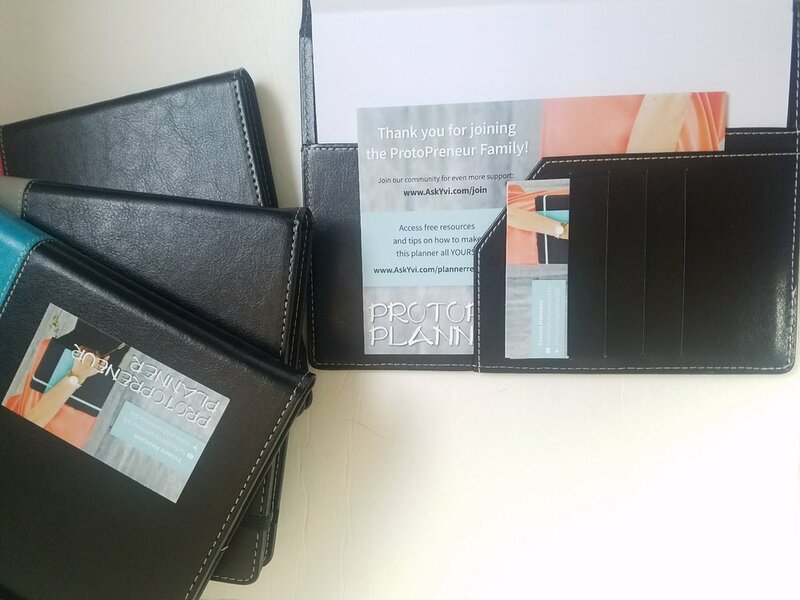 The protopreneur planner was designed for businesses and content creators alike. Wether you have a blog, youtube channel, Instagram, email list, business, etc. You'll find that this planner is an amazing fit for you. *There will be a video at the bottom walking you through if you'd rather not read. It comes in multiple different colors and even a plain black, so you can pick which planner best represents your style. (I obviously chose the pink for myself 😉.) The interior has multiple card slots and a secretarial pocket for business cards, ID cards, or extra note paper. The cover to this planner is extremely sturdy so I wouldn't worry about harm to your planner much. It has a faux leather look and feel, and it looks very well made with little to no errors. One of my planners was put in upside down, but it was an easy fix since the planner slides out of the cover. (With a little force of course. No need to worry about it flopping around in there on its own.) All I had to do was flip it around. The pages are an off white color by the way. Just a fair warning. There are multiple different pages and tools within the planner. The first few pages are for visualization of your life and business. It then talks about your goals and who your target audience is. The next few pages are for content schedules, and then it starts the first monthly page. The monthly had a spot for your content of the week, your finance tracker, notes, and work days. Its a very helpful overview and is extremely unique in its composition. Then you have your weekly overview. This is a two page overview. The left side is your weekly to do list and your project planner. The right side is for tracking your habits, and any important follow ups or people you need to contact. Then you get to the weekly pages. It is a vertical style weekly spread with time slots titled AM, Noon, and PM. I'll include a picture below. There is a notes section, your daily focus, daily highlights, gratitude and your time slots. There are no times written in, so you can write in your own ! A huge seller for me was that my happy planner stickers fit perfectly in the columns, and the headers fit perfectly in between lines. In the back of the planner there are some extra spots for brain dumps and project planning. Overall, I would highly recommend this planner to anyone who has a business, or just in general creates content. Be sure to check out the video for more in depth views of the planner and it's features. Comment below and let me know what you think !